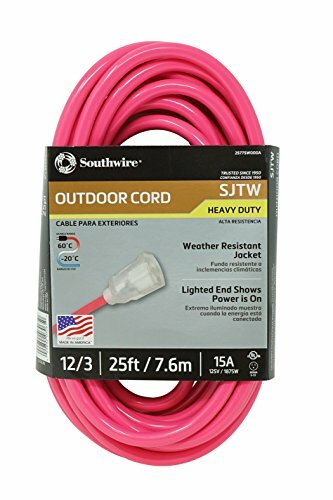 Coleman Cable outdoor extension cords are 12 gauge 15-amp cords manufactured with brilliant neon colored gloss on a flexible weather resistant vinyl SJTW jacket. These cool colors help prevent loss or theft on a job site as they are easily identifiable. For safety, the power cord end has a clear molded indicator light that lets you know when the power is connected and current is going through the cord. This outdoor-rated extension cord has heavy-duty strain relief durability and the blades and pins have been reinforced for constant use in any commercial or residential job ensuring longer life than most cords in the market today.